The three intertwining threads of ‘Victory of Glorious Defeat: Biographies of Participants in the Mayo Rebellion of 1798’ weave a fascinating story of which the backdrop is Ireland’s violent history of nationalist struggle, often set within the broader parameters of international struggle, particularly French republicanism. The placing of these broad historical moments into the very different worlds of the leading players in the heroic and sometimes sordid tale of the County Mayo rebellion of 1798 ensures this book’s accessibility beyond the realm of academia. The legend and folklore of hanged rebel priest, Father Manus Sweeney still resonates throughout Co Mayo. Pit that against the notoriety of ascendancy Lord Denis ‘The Rope’ Browne of Westport House and readers are assured dramatic stories. Add to this compelling cocktail, rebellious ‘Citizen’ John Moore and the famed Anglican Bishop of Killala, Bishop Stock, along with the rich folk memory about those who were transported to Australia in the aftermath of the rebellion, and the narrative is filled with dramatis personae. As well as essays by the book’s editor, Dr Sheila Mulloy, contributors include the founder of the annual Humbert School, journalist and author, John Cooney. Mr Cooney’s essay, ‘Humbert: A French General in Rebel Ireland, 1798’, chronicles the dramatic events that unfolded after the French general disembarked at north Mayo’s Kilcummin strand with 1,025 soldiers on the afternoon of August 22, 1798. Later in the book, in his essay on General Lake, James Quinn, editor of the Royal Irish Academy’s recently acclaimed Dictionary of Irish Biography, gives an account of the famous Races of Castlebar. Sheila Mulloy also contributes a fascinating essay on James Joseph McDonnell’s escape from the British through Rosbeg and the Deerpark, and then over the Reek to Connemara, whose boggy recesses proved to be the perfect hiding place for many rebels. Addressing the rich folklore about the rebellion, Guy Beiner, a history lecturer in Ben Gurion University of the Negev, Israel, writes about the ambivalence and fears of the Mayo peasantry during bliain na bhFrancach. He refers widely to the seminal work of folklorist, Richard Hayes. “Twas midnight when they got here to Lahardane and they stopped for an hour at the Fair Green beyond. They came to free Ireland, but a lot of people at the time were afraid and didn’t rightly understand. The people gathered around them in the green but they couldn’t understand the French language,” Lahardane resident John McNeeley told Hayes. 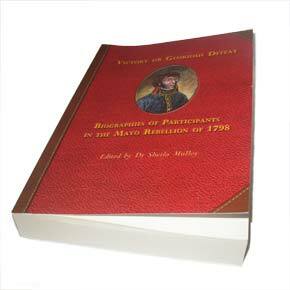 Dr Harman Murtagh, President of the Military History Society of Ireland, will launch ‘Victory or Glorious Defeat: Biographies of Participants in the Mayo Rebellion of 1798’ at the County Library, Castlebar, tonight, Tuesday, June 22, at 6.30pm. All are welcome. IMAGINE the frisson of excitement felt by a young west-of-Ireland woman when she arrived in war-battered Paris to study at the Sorbonne in 1945. Sheila O’Malley (later Mulloy), whose paternal forebears came from a remote farm at Kilmilkin, near Leenane, on the Galway-Mayo border, had won a prestigious French government scholarship, introduced as part of a strategy to restore the country’s renowned cultural dominance. This early influence and privileged experience went on to inform Dr Sheila Mulloy’s long and illustrious academic career. This was partly defined by her painstaking editing, indexing and preparation of the voluminous Franco-Irish Correspondence December 1688-92 on behalf of the Irish Manuscripts Commission. No mean feat, since it was achieved while bearing and rearing eight children. After Sheila’s return from France her academic odyssey at the Sorbonne, she had married a leading Westport businessman, John Mulloy, in 1949. Over these decades Sheila also developed her love of local history and acted as editor of Cathair na Mart, the journal of Westport Historical Society, founded by the late Jarlath Duffy and Peadar Ó Flanagáin in 1981. In the preface to ‘Victory or Glorious Defeat’, her son, Dr John Mulloy explains the complex genesis of this book of essays, edited by his mother. He writes how after 70 years of scholarship, Sheila, was recently forced to leave down her pen and take ‘a well-deserved rest’, leaving the final minutiae and practicalities of publishing to others. John fondly refers to his mother’s perfectionism. This biographical gem is testament to the application and fertile fruits of that quality.